Welcome everyone! Today is the second Wednesday of the month which means that we have a brand new Heartfelt Creations Release! Are you ready for an adventure? 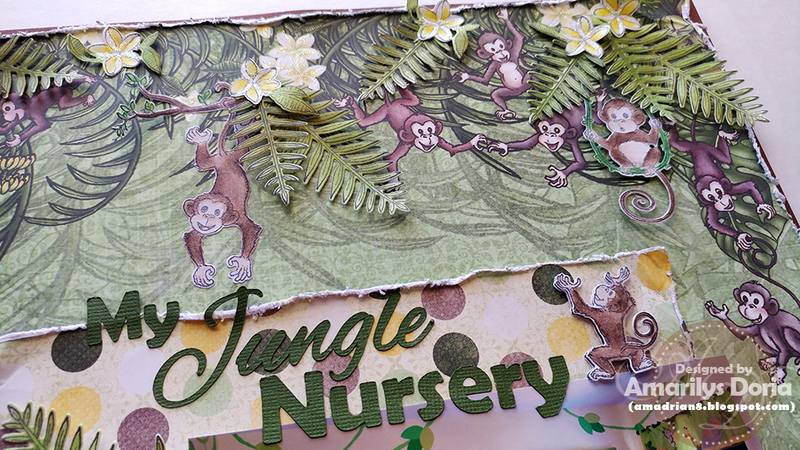 Grab your water bottle, sunscreen, and safari hat and join us as we explore exotic jungles taking in the lively and entertaining antics of the new Monkeying Around Collection by Heartfelt Creations! Filled with amusing illustrations of ever so charming monkeys, this newest collection is sure to have you “going bananas” with excitement! Four entertaining cling stamp sets supply you with an assortment of fun filled, mix and match monkey images to create just the right amount of monkey mayhem for any of your paper crafting project needs, while various sized palm tree fronds, floral accents, bananas, coconuts along with lush palm tree die cuts add a dimensional tropical feeling to your projects with ease! Trek through a paper collection filled with deep jungle greens, sunlit yellows and ocean like blues, accented with balmy breeze teals, pretty floral pinks and a hint of sunset reds creating just the right tropical color palette to showcase these adorable apes on cards, scrapbook layouts or altered art pieces. So, come along with us as we join in with the monkey chatter, swing from vine to vine and take part in the shenanigans of the new Monkeying Around Collection! 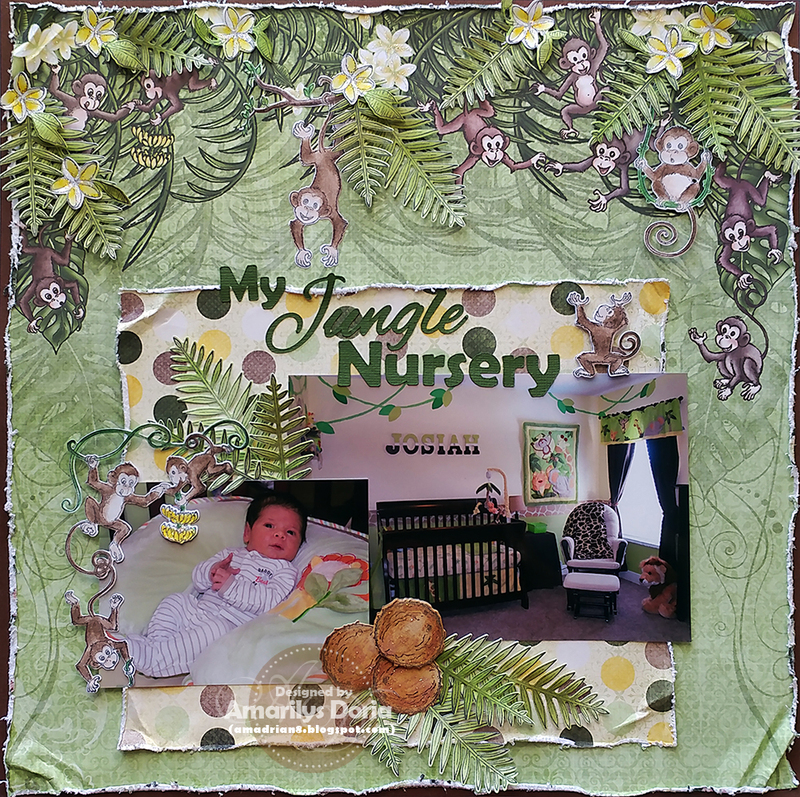 Here are some close ups my first layout using the new Monkeying Around Collection! Trim a paper from the Monkeying Around Paper Collection to 8" x 7" and another coordinating paper to 11.5" 11.5". Distress the edges with the Tim Holtz paper distresser. Mat the larger piece unto brown cardstock and layer the other one in the center. Add your 6" x 4" and 4" x 3" pictures over the pattern paper in the center. Stamp the monkeys from the Palm Tree & Monkeys Cling Stamp Set, Monkeying Around Cling Stamp Set and Monkey Antics Cling Stamp Set as well as the leaves in different sizes, flowers and coconuts on white cardstock. 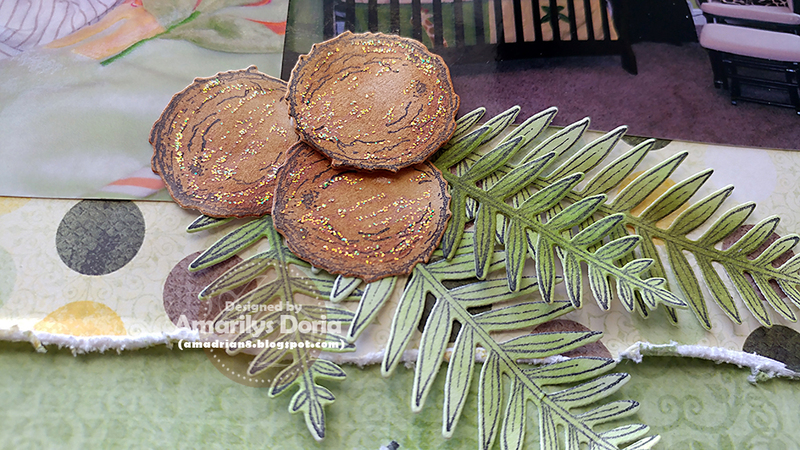 Color the images using Prismacolor Pencils and blend using Odorless Mineral Spirits. Die cut each image using its coordinating die and pop dot them before adding them to the layout as shown. Finish by adding a die cut title on top of the larger picture. As always I love your layouts! This is a very creative project and I love all the attention to detail! 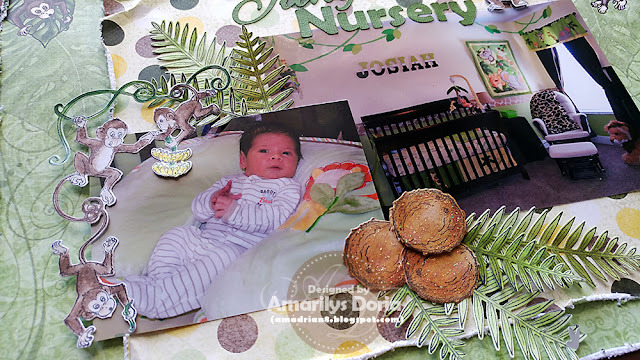 Love the layout and the nursery!